Are you ready to head out into the world with Gramps? Well, this ought to be interesting. Here are a couple tips for surviving a round of errands. First of all, don't expect to get too much sleep. Grandpa Rick doesn't hesitate to remind all of his family that nighttime is half the time we're given. And if you're going to explore all that a multiverse has to offer you, you're going to have to get used to taking micro-naps during your menial high school science classes. Also, take disaster with a grain of salt. Sure the world might be overrun by monsters that are madly in love with you, causing your Gramps and you to seek existence in another reality where the two of you have recently kicked the bucket. That's okay. Life goes on! If you think you're ready to ride along, you'll need the cartoonish expression of young Morty. 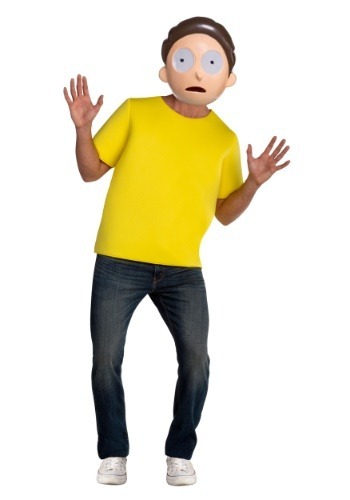 Let us help you out on this journey of discovery with this perfectly worried looking Morty costume. You'll look just like the cartoon grandson created by Justin Roiland and Dan Harmond with this licensed costume. The bright foam t-shirt gives you Morty's square body while his dazed and slightly scarred expression will make you ready to react to whatever your Grandpa rick throws at you. It's about time our dimension became as interesting as the one where Rick and Morty argue with aliens and bootleg incriminating substances through the multi-verse. This Halloween by having a group of people don costumes from this hit show. The best part is, doubling up on the same costume is just he going to make the show seem like it's coming to life. Multiple Rick and Morty teams showing up at the same party just means that different realities are coming together. The more Mr. Meeseeks there are the better! Go ahead, live the Rick and Morty lifestyle. Just remember Wub a Lub Dub Dub!